The slick new series of shooting head lines from Greys incorporate an innovative taper for high speed energy transfer leading to tight dynamic loops. 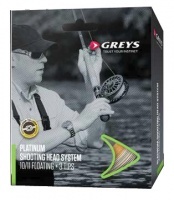 A casting head of around 4 times the length of the rod ensures ease of casting along with perfect presentation at both long and short range. The best performing Fluorocarbon on the market. Whether nylon or fluorocarbon, TroutHunter tippet material offers unsurpassed strength and reliability.